TSP G Fund - What is the G fund? What is the G fund? The TSP G fund is designed to earn inflation-beating interest with no risk of losses. You receive the weighted average yield of long-term Treasury notes and bonds. Since longer duration bonds have higher interest rates than short duration treasuries, you receive a higher interest payment than money markets or Certificates of Deposits (CDs) without the risk of capital losses that come with the F fund. The Thrift Savings Plan says the TSP G fund is invested in short-term US Treasury securities, but this is a bit misleading. It is short-term in the sense that it is a virtual security that adjusts its interest rate monthly. The interest rate is determined by the long term treasuries. The goal of the fund is to maintain a higher return than inflation. Payment of principal and interest is guaranteed by the U.S. government. The interest rate resets monthly. How does the debt ceiling effect the G fund? The Thrift Savings Plan website provides the following answer. When it reaches the debt limit, the Treasury has to find ways to manage its cash and borrowing so that it can continue funding government activities. One of the many ways it can do this is by suspending investments of the G Fund. As a G Fund investor, you should know that if the Treasury takes this action, your investment is always protected, and your G Fund earnings are fully guaranteed by law under the Thrift Savings Plan Investment Act of 1987. Your G Fund account balance would be exactly the same from day- to-day as if it were invested in Treasury securities. It will continue to accrue earnings and be updated each business day, and loans and withdrawals will be unaffected. My translation: Since the G fund is not really invested in real treasuries and the interest rate is formula derived, nothing changes except in terms of accounting. The government merely moves the G fund from the US debt ledger to a non-US debt ledger. It is still your money, it still earns interest. It allows the government to play their debt ceiling games. The G Fund is invested in non-marketable U.S. Treasury securities specially issued to the TSP. There are no transaction costs to the TSP. The G Fund rate is set once a month by the U.S. Treasury based on a statutorily prescribed formula. Although the securities in the G Fund earn a long-term interest rate, the Board’s investment in the G Fund is redeemable on any business day with no risk to principal. The value of G Fund securities does not fluctuate; only the interest rate changes. 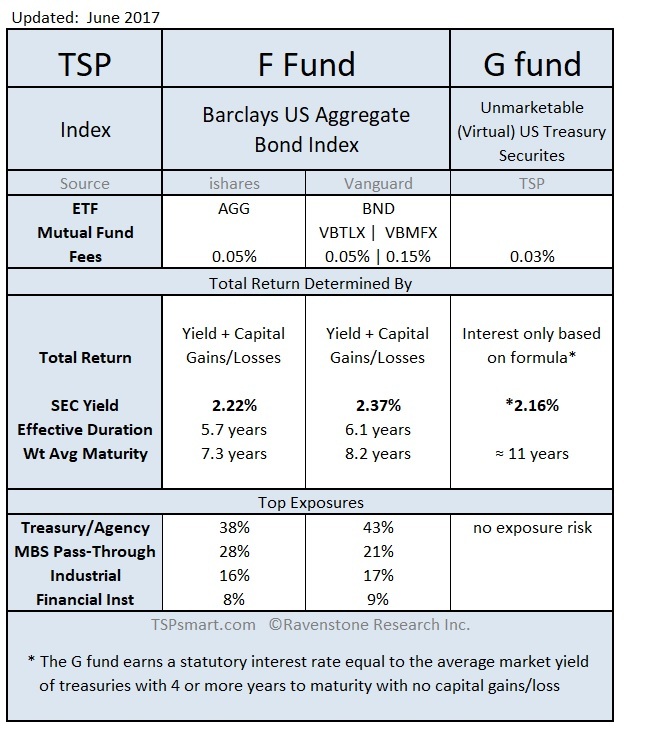 Calculation of G Fund Rate— G Fund securities earn a statutory interest rate equal to the average market yield on outstanding marketable U.S. Treasury securities with 4 or more years to maturity. The G Fund rate is calculated by the U.S. Treasury as the weighted average yield of approximately 130 U.S. Treasury securities on the last day of the previous month. The yield of the security has a weight in the G Fund rate calculation based on the amount outstanding. The Treasury securities used in the G Fund rate calculation have a weighted average maturity of approximately 11 years.